Scammers are spoofing an Office of Attorney General phone number in an attempt to get citizens to pay them money. Spoofing is a tactic which allows people to mimic the phone numbers of legitimate businesses on the receiving party’s caller ID. Some of the scammers are posing as agents from the Office of Attorney General and fraudulently claiming the call recipient owes money. The calls appear to originate from the attorney general’s office, but are actually coming from another phone number. 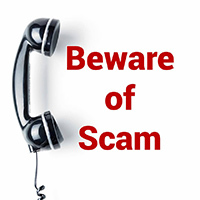 Other individuals reported scammers are using the “Grandparent Scam” from the same phone number. These callers falsely claim a grandchild of the call recipient is in jail and needs bail, or has been in an accident and needs funds. These scams frequently target senior citizens. If you have received one of these fraudulent calls, please call the Office of Attorney General Bureau of Consumer Protection hotline at 1-800-441-2555, email scams@attorneygeneral.gov or click here to file a complaint. In the meantime, if you know you’re receiving a scam phone call, hang up. Don’t press any buttons and, if you received a voice mail message, don’t call the scammer back. Don’t trust caller ID and never give out personal information such as account numbers, Social Security numbers, mother’s maiden name, passwords or other identifying information in response to unexpected calls. Legislation will soon be on the governor’s desk that will allow senior citizens who received a Social Security cost-of-living increase to keep their eligibility for the state’s PACE and PACENET prescription drug benefit plans. A law preventing seniors from being disqualified from the programs solely due to a Social Security cost of living increase was set to expire at the end of this year; however, House Bill 425 would continue the exemption through Dec. 31, 2019. Senior citizens are reminded that the deadline to apply for the state’s 2016 Property Tax/Rent Rebate program is Dec. 31. Applications are available at my district office. Assistance in completing the forms can be obtained at the Lebanon County Area Agency on Aging, 710 Maple St., Second Floor, in Lebanon. Call for an appointment at (717) 273-9262. Eligible participants can receive a rebate of up to $650 based on their rent or property taxes paid in 2016. The program benefits eligible Pennsylvanians who are 65 years or older, widows and widowers 50 years or older, and those 18 years or older with disabilities. For complete eligibility guidelines, click here. Applicants should be prepared to provide all the necessary income, property tax or rental information required to process claims quickly and accurately. Applications for the 2017 program are expected to be available in early February. While the holiday season is often the most charitable time of the year, consumers are encouraged to be wary of scams aimed at taking advantage of their good will. For your protection, the Pennsylvania Department of State’s Bureau of Charitable Organizations maintains a publicly accessible online database that contains all legally established charities in Pennsylvania. Consumers are encouraged to verify the legitimacy of any charity using this database prior to donating. To learn more about an organization prior to donating or to report suspected fraud, call the bureau’s toll-free telephone hotline at 1-800-732-0999.